This is a lot of 10 handcrafted dichroic glass cabochons that I cut and fused myself. This lot contains matching pairs in both medium and small cabs, ranging in size from 14mm to 6mm. Dichroic glass flashes different colors from different angles. These cabs are primarily purple, green, yellow and pink on a black background. I have capped these cabs in clear glass to give them depth. Crinklized dichro is unique in that when fired, it appears to splinter into shards. However, because they have a layer of clear glass fused over them, they feel perfectly smooth to the touch. Unfortunately my camera cannot adequately capture the richness, depth and sparkle of these cabs. I'm told they look much prettier in person. It's very difficult to capture the beauty of these cabochons. As one customer once described them: "A jewel box in every lot!" This is Lot #36. You will receive the actual cabs shown in these photos. Please refer to the photo of these cabs in the palm of my hand for the best possible representation of size and color. 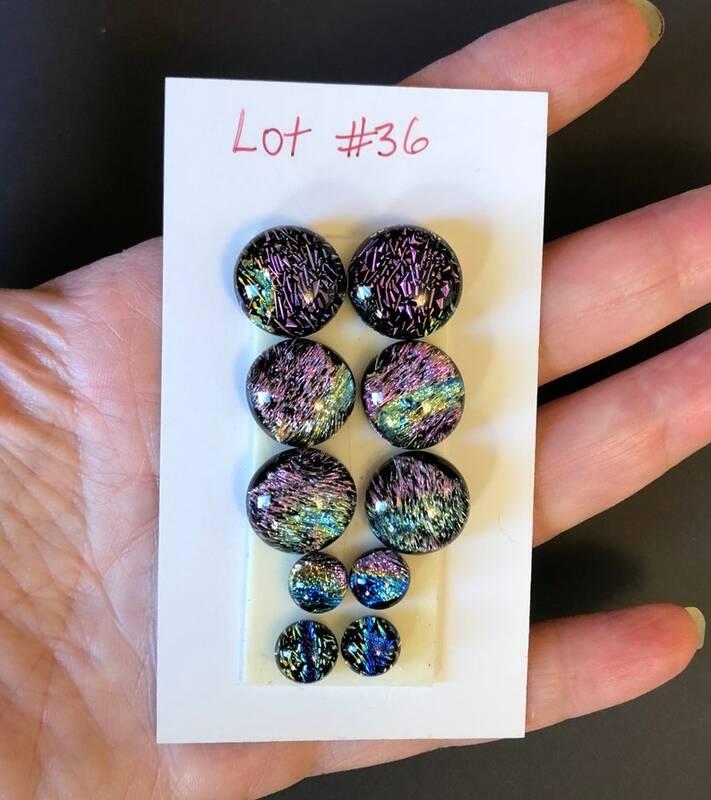 These glass cabs work wonderfully in your jewelry creations, especially with metal clay, mosaic and mixed media projects. Every cab has been carefully kiln-annealed and cleaned with warm soapy water to remove all traces of kiln paper residue.